I tried twice again, not being too happy with the first try. I took on another corner, more “architectural”, more detailed, brighter colors, with which I am quite content..it feels like “me”. And I just can’t get away from it- detail- I need detail. Without it, I can’t stress. I can’t be obsessive compulsive. Without detail in my life, I can’t experience beauty. I can’t create beauty. Without detail, life is very foggy and leaves only an impression of what might be out there…very much like the first painting of these wisterias. Wonderful again, Ronell. I love the way the shadows “dance” on the wall surface created by your careful layering, especially in the first one. I like how you do these a couple of times! Lovely job. I’ve been trying to get my wisteris to bloom for YEARS. Stubborn things refuse to flower. You are persistant arn’t you! The signs of a good detail person….I recognize it because that’s me too.Those wisteria are wonderfu and beautiful. So glad you persisted to your satisfaction.BTW, I was just reading about creativity and a detail person is called “bios’ or the dteails of life, and the person that has an overview of things is called ‘zoe’ or the essence of life. GORGEOUS GORGEOUS GORGEOUS!!!! The frost nipped ours and I haven’t seen much since then — so I am thoroughly enjoying yours!! Did you know you can eat the flowers?? BUT ABSOLUTELY NOT THE SEEDS!! I love wisteria, and you’ve really captured it in these lovely pictures! beautiful! i LOVE wisteria and the draping laziness of it. great pictures! Love the wisteria – I, too, have been trying to get mine to bloom – they are 9 years old now. Is there any hope?These a gorgeous! These are both beautiful, but the second one does more to convey the delicacy of wisteria – such a tough subject. I love Wisteria and mine is huge, but never blooms !!!!! I want to paint them too!!! Just Lovely! You have been busy! 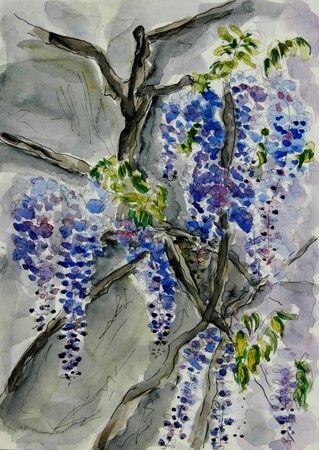 I’m another wisteria fan, and I agree that you’ve really got the essence of wisteria in this second painting. The twisted branches and those wonderful long cascades of blue/lilac flowers. I once painted the detail of just one of those tiny little flowers – I may post it on my blog. I understand all about detail. Yep! As much as I try to get away from it, I am only happy when it looks like what I’m looking at. These are both so beautiful. 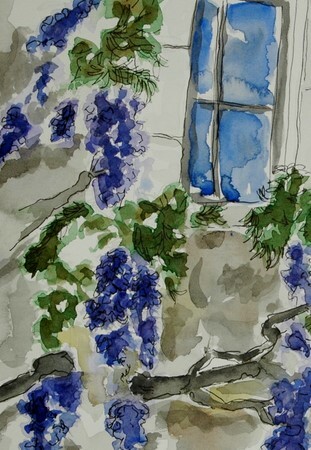 I love wisteria, too, the way it hangs and looks. It’s all around my house, but not in my yard. Wonderfully done.